Ron's Rocks is a family-owned business, based in Palmerston North, New Zealand. We are importers and wholesalers of premium quality crystals from around the world. We are in a handy location to ship stock to our customers all over New Zealand, and the world. At Ron's Rocks, we pride ourselves in the quality of our crystals - we hand select them ourselves, as if we would be using them, or displaying them in our home. We also take great care in the way the crystal is presented for sale, which we get many positive comments about. We stock nearly 200 different types of tumbled, polished stones...from the agate varieties to zebra stone. As well as smooth, polished stones, we also stock rough rock in small chunks, and large door-stop sizes - all natural, just as the rock came out of the ground. We're also supplier of a wide range of smudge sticks, including various varieties of sage. There's more to smudging than white sage - there's blue sage, black sage and whole lot of other aromatic plants available for smudging. See the range on the sensational smudges page. All smudges are packaged respectfully. We are crystal wholesalers, meaning we on-sell to other businesses. If you are interested in stocking some of the Ron's Rocks range, please send an email, along with your business name, location and daytime phone number to info@ronsrocks.co.nz. Keep your retail stock tidy and attractive for customers with this set of acrylic display bins. There are 24 compartments in this 4-tier set. Manifestation is one of the new smudge sticks now available. It's a mix of Frankincense, Vanilla & Sandalwood. 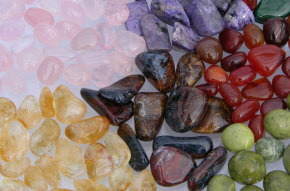 semi-precious gemstones, the Metaphysical Mysteries range of gift boxed crystals and much more.